At the age of 25, Charles Revson co-founded Revlon Cosmetics, which he built into a major international cosmetics corporation. 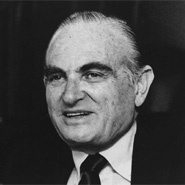 Revson served as president of Revlon until 1969 and as chairman until his death. After reaching the heights of his chosen profession, in 1956 he established the Charles H. Revson Foundation, through which he donated millions in his lifetime to education, medical research, Israel, and Jewish charities. The Charles H. Revson Foundation continues to carry on his legacy by contributing more than $9 million annually to "expanding knowledge and improving human life."